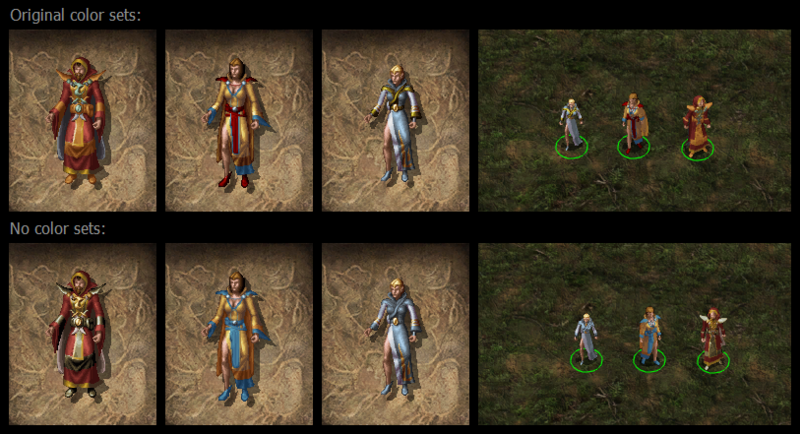 This mod aims to make mages in the game to appear more stylish. For that end it adds mage-specific staffs with ranged attacks and circlets, plus it also tweaks all robes, so that player can choose their look. The idea of this mod began in the Narbucchad's Demise Wizard's Staff thread, after I discovered the ranged staff animation within the game files. Since version 1.3, BG:EE and BG2:EE content has been combined into one single mod. It will recognize the game and skip the content of the other. There are a lot of components now, so I will try to describe them here as clearly as possible. In version 1.5 I added familiar tweaks and a lot of other tweaks and fixes (see the changelog below). Before installing v1.5, you must uninstall and delete previous versions of MSFM from the game directory (most importantly MSFM.tp2 file). I changed a file structure a bit. There are two options here. The first one adds 7 Staffs with unique animation and +1 enchantment, to the High Hedge stock and Xithiss in the Black Pits, after the first upgrade of his stock. 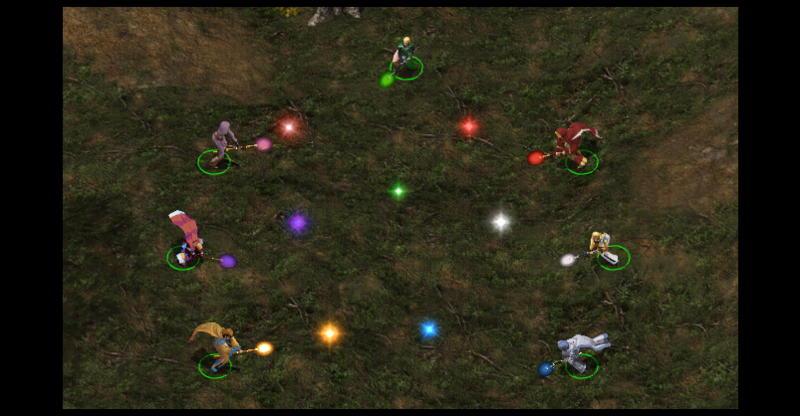 Each one has different color, mainly to fit different color styles of NPC mages. The second one add 6 staffs into those shops, and each one can be customized through the item abilities menu with 14 possible color choices (this option is newer, but I decided to let the old colorsets in too). This component adds 7 Staffs with unique animation into the store of Garlena, the helmite on the top of Watcer's Keep. She can be accessed from both SoA and ToB. These Staffs have both ranged and melee attacks and you can switch between them. Since version 1.3, they are also available in the Black Pits 2, in the stock of the un-named Illithid. These staffs can be customized through the item abilities menu with 14 possible color choices. 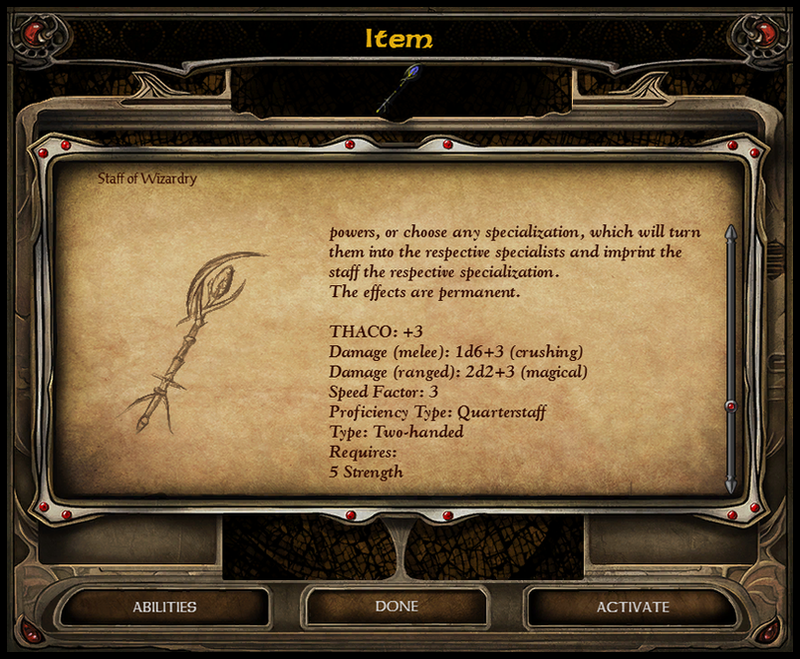 In BG2:EE, they are called Staffs of Wizardry and are +3 weapons. But the main difference from BG1 is, that I decided to expand an ambition of this mod a bit and include the problematic area of specialist mages. Each of the staffs can be further empowered, when its wielder reaches 250 000 XP in total, by clicking on a button "activate" in the item description screen. If it's wielded by a specialist mage, staff will be imprinted with his specialization, receiving additional school-based abilities (the list of abilities is below). When a pure mage activates the staff, he will be given a choice to either empower the staff universally, or to choose any specialization (including wild magic), which will turn him into the respective specialist and imbue the weapon with respective specialization. This is mainly to allow dual and multi-class mages to specialize in-game. Sorcerers can only choose to empower the staff universally. Note that if you are dual-classing from a kit, you will loose that kit with all its powers and become a specialist, with original pure class. Also, when you become a specialist this way, all spells from the forbidden school will be erased from your spell book, and all your memorized spells will be drained in the process. So you better do this before resting. This doesn't apply to wild mage. Also, since v1.5, an additional spell per level is gained to a specialist after the next level-up (this is a bug fix). Dragon Fear: All enemies within 40 ft. Radius must Save vs. Spell with -4 penalty or flee in terror. Some creatures are immune to the effects of fear, including all undead. Summon Fire Giant: Summons one Fire Giant, which is under complete control of the party for 15 rounds or until it’s slained. Prediction: Caster gets bonus to +6 AC, -6 to THACO, +3 to saves and becomes immune to backstab and normal missiles, for 5 rounds. Thrall: If failed save vs. spell at -2 penalty, target is permanently under complete control of the caster and acts as a party member. This spell also ignores mind shielding protections. Mass Polymorph Other: Same as Polymoprh Other spell, but covers 30 ft. area and all enemies must save vs. spell at -2 penalty. Lesser Dragon Form: For 2 turns, caster is transformed into a small dragon and receives substantial melee bonuses. This spell uses Red Abishai animation from PST provided for EEs by viader and his Extended Animations Resource Pack. Staffs of Wizardry for IWD:EE are very similar as for BG2:EE. The differences are, that the staffs (which are available in Orrick's shop) are only of +1 enchantment when bought and they will get to +3 only after the "activation" when the wielder is over 250 000 XP. Then, the staff can be upgraded to +5 the same way, when he reaches 1 000 000 XP. All spells and abilities remain same. This component has been rendered somewhat obsolete, because unlike BG:EE, there are now original inventory animations for these staffs, as the game uses the animation for the Staff of the Magi and Staff of Ram. Still, you can choose between the original, and the custom, that I made for BG:EE (See screenshot). If you install this component, custom will override the original, if you don't install, you will have the original. Firstly, this component adds ranged attack to the Staff of the Magi. You can choose melee or ranged the same way as it works for Staffs of Wizardry. The projectile has yellow color. Secondly, I decided to add an optional tweaks to it, that change the equipped invisibility to something else, so that doesn’t tempt to exploit re-equipping all the time. Ranged attack is added to each choice. In BG1, circlets already exist in the game files, with proper names and descriptions, so I merely put them in Thalantyr's stock (and to Xithiss in BP as well). They have (tiny) paperdoll animations, but they were missing inventory animations, which again I drew for them. In BG2, these circlets are not within the game files anymore, so I took them unchanged from BG1 and put them into the stock of Garlena, the helmite, on the top of Watcher's Keep. Only Circlet of the Archmagi and Eilistraee's Boon +1 were added. Unlike BG:EE, circlets have original inventory animations. In IWD, Circlet of the Archmagi and Eilistraee's Boon +1 are added to Orrick's shop. This item allows mages to become specialists the same way as Staffs of Wizardry in BG2 work. But because Wizard's Staffs in BG1 don't offer such option, I made this one to make it possible in BG1. The circlet is available in Thalantyr's stock and can be used multiple times. But it only works for non-specialist mages (including dual and multis), so once mage becomes a specialist, he cannot use it to change his specialization. The effect is permanent. Note that the additional spell is gained after the next level-up. This component adds a Wizard's hat. An item with some magical properties and completely new custom animation made by @Smiley for human male mages and sorcerers (the limit is there because the animation only exists for them). This component adds a Wand Case with the storage capacity of 50 pieces to High Hedge, Garlena’s and Orrick’s shops. [BETA] This component adds unique artifacts into SOA and TOB campaigns, which allow the whole party to be instantly teleported to previously visited surface areas. The effect does not work at plot critical places, such as Spellhold, Underdark etc. The component is currently in a beta state, because I didn't test it through the whole game. Use it with caution, it is theoretically possible to skip plot critical triggers. Robe tweaks section doesn't add new items, but only tweaks existing robes. It gives them the ability to switch between all three possible visual types (no hood and no cape, no hood with cape, hooded with cape) via item abilities. Every robe then looks as original by default, but has two item abilities, which can change their looks to the other 2 visual types. This allows to set the favourite look for your wizard (and overcome some graphical glitches - elven female horribly colored leg comes to mind...). Robe tweaks come in two versions. 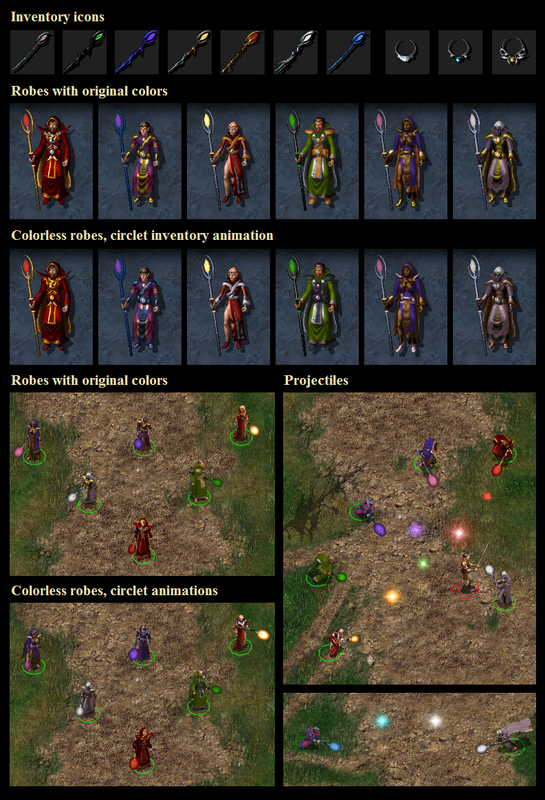 One version keeps all original set colors of robes and the other removes them, which makes them use character's colors instead. Note, that as a side effect, I had to make all robes automatically identified. This component patches the mage robes, so it is compatible with mods that alter them. You must install this mod after such mods, however. This component allows you to enjoy the custom colorsets for Robes of Archimagi made by @Dee in his Mr. Pennyway's Cosmetic Changes mod. When a protagonist casts Find Familiar, a dialog window will trigger, where he will be able to choose its race, class and a name. For now, all races have the same statistics, so this is mostly just about choosing the appearance. Upon each upgrade, the familiar also improves its hit points, AC, THACO and saving throws. Its detailed statistics are shown in the item description, when it‘s in your backpack. There are three name slots you can choose from. It’s “Isane”, “Kailey” and default “Familiar”. In the next component you can change these names with your own. As written above, there are three names you can choose for your familiar. It’s “Isane”, “Kailey” and default “Familiar”. This component allows you to type your own names during the installation process. You can choose to type one, two or three names and your names will override the preset ones, so in the dialog window, you will be able to choose from your own names. There is a warning though, if you change any other mod component that you installed before, that updates game texts, the installation process will prompt you to write the names again. NPC mages can finally summon their own familiars, when they cast a Find Familiar spell. Only vanilla arcane spellcasters can summon familiars (plus Khalid, Safana and Yoshimo – if they get spellcasting ability). NPCs cannot customize their familiars even if the above component is installed, they have preset ones. They have different races, unique names and most of them are mages, except of Yoshimo’s, which is a thief. Also, when a summoner talks to his familiar, a dialog, unique for each NPC, will trigger, at which end, the NPC will take it to his backpack. There are no more banters yet, but they may come in the future. If anyone wants to cooperate on this, they are welcomed to. Familiars get upgrades the same way as the ones from “Customizable familiars“ component. When these familiars die, NPCs don’t loose CON point, but neither do they get a hit point bonus, when they summon it. Also, any number of familiars can be summoned at the same time, however, when you control more than seven creatures, you get messed up formation target points for the rest of them, when you move. UPDATE: The Lim-Lim tweak below is fixed, the animation works differently now. There are two animation tweaks I had to add, both of which I hope to resolve in the future. The first is a walking sound for Lim-Lim, which is currently hardcoded with heavy footsteps of large creatures (such as dragons). The tweak will replace these sounds with light footsteps, but it will effect all large creature’s walking sounds in the game, so only install it, if you want to play with a Lim-Lim familiar (also Haer’Dalis and Quayle have a Lim-Lim familiars). The second tweak resizes the Demilich animation, because the floating skull familiar uses it. So, it will make Kangaxx and the Demilich from Watcher’s Keep smaller. In BG:EE no creature uses this animation, I’m not sure about IWD:EE. This adds more scrolls to the High Hedge, Sorcerous Sundries, Garlena and the spell merchant in the Adventurer’s Market in BG:EE and BG2:EE and to the Black Pits, so that more NPCs can cast it. Extract the "msfm v1.5.zip" file in the game's core folder (the one with a file "chitin.key" in it) and run "setup-msfm.exe". All parts can be installed individually. Before installing the version 1.5, I strongly recommend to uninstall the previous version and remove it completely from the game directory. You can also use non-WeiDU install (but only for BG:EE!). If you extract "BG1 override install.rar", there will be three folders with staffs, circlets animations and robe tweaks. Just put the content of a folder you want to use in the override folder. Note that the non-WeiDU install will miss correct descriptions of Wizard's Staffs. Important: If you purchased your BG:EE game from Steam or GoG and you have a SoD expansion installed as well, you need to first install DLC Merger before installing any mod. Last but not least, this mod would not be what it is without help of @KidCarnival and his ideas. Special thanks also goes to @Anduin and his prowess in english grammar, which allows you to enjoy this mod without grammatical errors. Of course I must not forget to thank @Dee for allowing me to incorporate his awesome colorsets to my mod and @viader, whose work on extended animations I used for this mod. This makes me a very happy paladin. I must apologize for a slight misinformation regarding the amount of damage of ranged attack. It is in fact 2d2 +1 damage, not only 2d2. I have overlooked this, but now I decided to keep it that way. Can I suggest to implement a more detailed description? Ranged attacks are not mentioned in the string you used. Yes, that is a problem, as I mentioned in the first post. But that would unfortunately require making a Weidu mod, which I can't at the moment. Or is there some other way? Well one day I'll learn it... one day... I have some other mods I'd like to publish anyway. This mod is fine just as it is, cos it works in Ipad! Since it does not change dialog.tlk. I see it was not a design choice but it works so well. I just copied the files into portraits folder in my ipad and it works. Happy! Thank you for this mod! I wanted to do something like this. Glad you got this going. This just keeps getting better and better! Please keep up the awesome work! Added all staffs and ciclets in the Black Pits. Along with Elven Chain. @KidCarnival: I don't know what you mean. I think all rars are named properly. I decided to leave the Elven Chain here, instead the first thread, to keep it from being too crowded, and since it's an off-topic item. So, as per request, the rar file contains elven chain mail for the Black Pits, with Gorch the Armorer, after the first upgrade of his stock. Do the new circlets use existing strings for their descriptions? @Aedan: Yes, they already exist within the game files, I merely put them in the High Hedge stock. Added visual tweaks to robes. This is my favourite Mod on the Citadel! How about a noob question :P ?! Where do I extract these files ?! P.S. I am a noob in modding but veteran in playing !!! @Bagor: extract all files in the override folder, which should be the core folder of the game (the one with "chitin.key" file in it). If there is no override folder, then create one and put it in. @Bagor: you don't need to start a new game as long as you haven't visited Thalantyr. After you do, his stock is saved in your save file, and you would need to edit that. I did suspect it has something to do with visiting Thalantyr... because I installed other mods (extra merchants) and they worked fine without starting a new game! Thanks for fast reply and of course for this awesome mod ! @Pecca could you say, what shall I do if I have visited Thalantyr and I want to use your mod? @vigovilingar: probably the easiest way is to console them in with command CLUAConsole:CreateItem("wstaf01") with number 01 to 07 for these staffs. Circlets have console code "band02" to 04. If you use Near Infinity you can edit your save directly and erase "highhedg.sto" file from it, which would cause the game to think you havent visited him yet. I tried the BG2 Tweaks mod with this, apparently the part that allows spell casting in armor seems to count the circlets (or atleast the Archmage one) as Splint Mail and hinders casting quite badly.